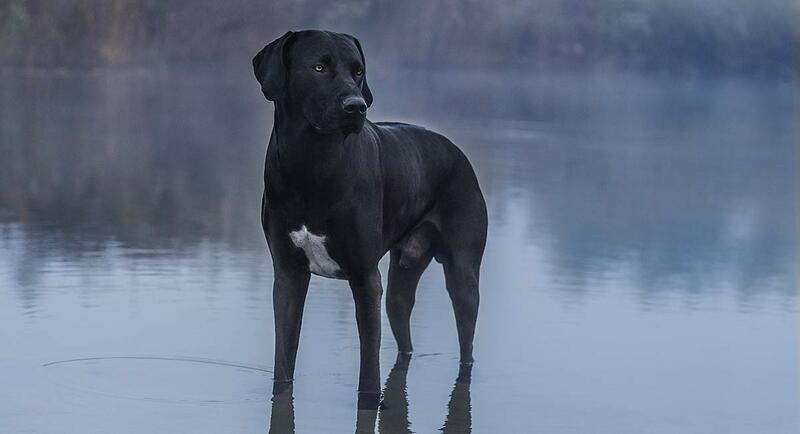 Great Dane Lab Mix - It’s Time To Meet The Labradane! You are here: Home / Breeds / Mix / Great Dane Lab Mix – It’s Time To Meet The Labradane! Great Dane Lab Mix – It’s Time To Meet The Labradane! Have you heard of the Labradane? This is the nickname for the Great Dane Lab mix. Bred from the gentle giant and America’s favorite dog, a Great Dane Lab mix is big, friendly, and smart. Do you think the Labradane is for you? This guide will help you answer that question by providing a multitude of information about the breed, including exercise and training needs, potential health risks, and more. Speaking of health risks, there is an ongoing debate about whether purebreds or mixed breeds are healthier. 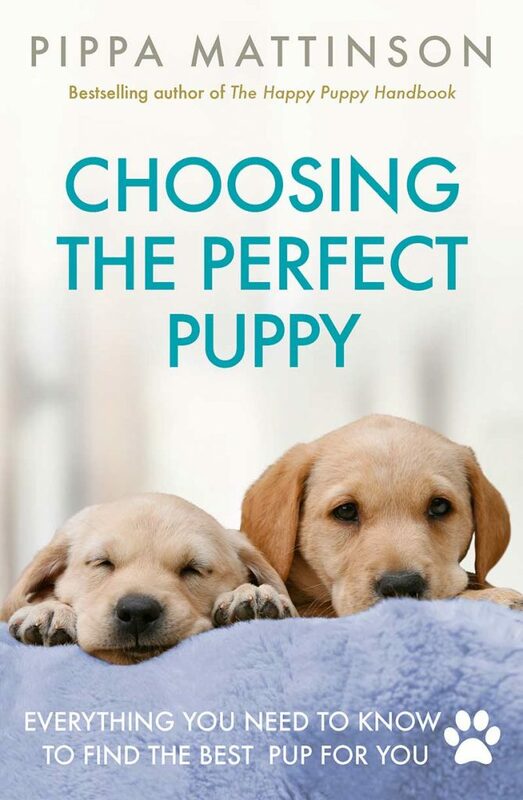 We’ll take a look at this controversy before we learn more about Labradane puppies. A designer dog is a cross between two purebreds to create a first generation mix. Designer dogs have become popular for their looks in some cases, but also because there is a widespread belief that they are healthier than purebred pooches, due to greater genetic diversity. Purebred enthusiasts argue that these mutts are not any healthier. In fact, they feel that purebreds are healthier because their health risks are well known. Responsible breeders can avoid breeding dogs that have these issues. So who’s right? To figure this out, we have to look to science. What is most important is fitness level. Fitness is the ability to produce offspring that are also capable of reproducing. Purebreds can have high fitness levels, when they are bred with other purebreds that have no relation to them. Inbreeding is a problem because it reduces fitness. Beuchat has also analyzed a study about purebreds and mutts which suggests that purebreds are more susceptible to a larger amount of genetic disorders than mutts are. The study examined the veterinary records of 27,254 dogs and compared the incidence of 24 genetic disorders in both purebreds and mutts. Purebreds showed a higher incidence of 10 disorders, mixed breeds showed a higher incidence of 1 disorder, and they shared the same incidence for 13 disorders. The Lab’s earliest known use was in Newfoundland as a retriever of fish from nets, as well as those that fell into the water. Some Labs were taken from Newfoundland to Britain, where the second Earl of Mamesbury used them as hunting dogs to retrieve downed fowl. Among early hunting dogs, the Lab had competition, but its ability to track ground scents eventually made it the most popular choice. The Lab’s easy-going temperament and intelligence caused it to gain favor outside of the hunting realm, and today they are a popular choice for family pets and service dogs. Despite the name, Great Danes are not Danish. Instead, they were developed in Germany around the 17th century. They were mainly used to hunt wild boars, so they were bred to be courageous. Though no longer boar hunters, Great Danes have retained their imperturbable nature. Their gentle nature also makes them suitable service and companion animals. Labrador Retrievers are medium to large dogs and weigh between 55 and 80 lbs. They stand between 21.5 and 24.5 inches tall. Great Danes are some of the biggest dogs out there, weighing between 110 and 175 lbs and standing between 28 to 32 inches tall. A Labrador Great Dane cross will likely be large to extra large! 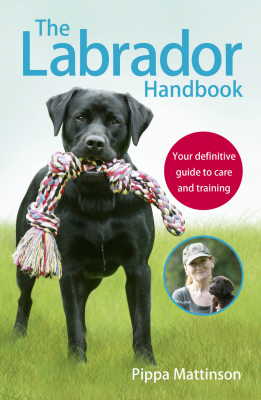 Labradors have a short, dense double coat consisting of a thick undercoat for warmth and a waterproof top coat. According to the AKC, Labs come in three recognized colors — yellow, black, and chocolate — but you may also have seen silver, white, or fox red Labs. The latter two are hues of yellow, whereas silver is a shade of chocolate. Standard Labs have triangle-shaped ears. They are set far back and lay close to the head with brown or hazel eyes. Their muzzles are medium length and they have black noses (brown for chocolate Labs). Deviating from breed standards, there are also Labs with pink noses and golden eyes. Great Danes have deep set eyes and high set ears which fold over similarly to the Lab. Cropped ears are also common, and point straight up. Their coat is short and sleek, and unlike Labs, Great Danes come in a multitude of different colors. Of these, the harlequin color can be problematic and cause embryonic death. The puppies that have two copies of the problem gene die early on in the womb. The harlequins that survive have a different genotype than the embryonic lethal puppies. The merle gene is also associated with deafness. Based on the parent breeds, you can expect your Labradane to have a short coat and floppy ears, but the rest will be up to fate (and genetics). To get a better idea of how your puppy will turn out, visit the breeder to take a peek at the parents. Labrador Retrievers are currently the most popular dog in the U.S., according to the AKC. 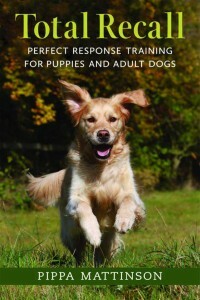 They are friendly, intelligent dogs that are relatively easy to train and eager to please. I was five when my family got our first Lab. He was patient when my brothers and I were annoying, and he loved to play with us outside. Typically, Labs do well in families with children. Likewise, Great Danes are friendly, smart, and patient. 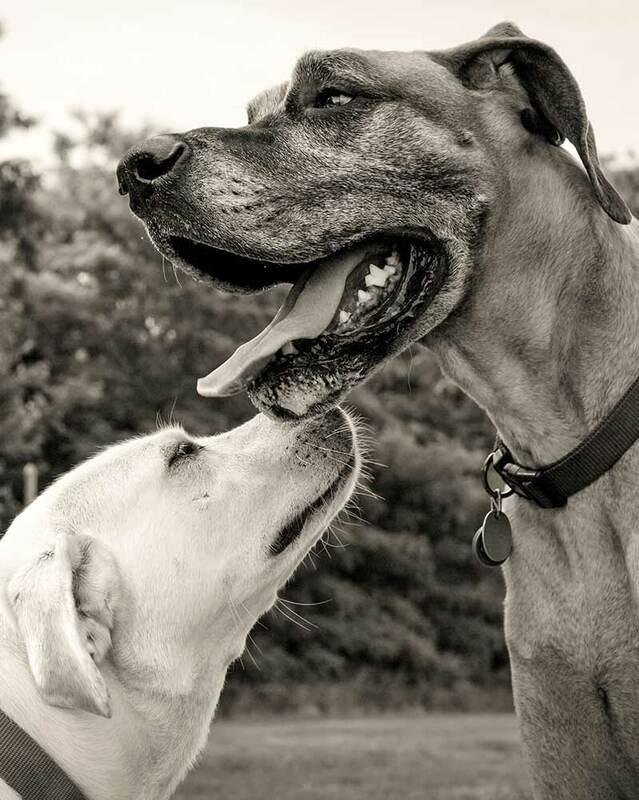 These gentle giants do well with children, so you can expect the same of Great Dane Lab mix puppies. Labs are active dogs, whereas Great Danes enjoy relaxation. Your puppy could either be rambunctious or calm. Despite being gentle in nature, the Great Dane’s size can seem intimidating, which makes for a good guard dog. This will be true for a Labradane as well, as it will be a big dog. Unlike Great Danes, Labs shed a lot. Whichever parent your puppy takes after, weekly brushing is a good idea to keep the coat looking sleek. A Lab Dane mix’s ears should be checked regularly for infection if they are left hanging rather than cropped. Also your dog will need his teeth brushed often and nails trimmed as needed. Labs are at risk for arthritis, bloat (gastric dilatation-volvulus), cruciate ligament rupture, epilepsy, eye problems including cataracts, progressive retinal atrophy (PRA), retinal dysplasia (RD), hip and elbow dysplasia, and osteochondritis dissecans (OCD). Cruciate ligament rupture occurs when a ligament in the knee (located in the hind leg) breaks or tears. This can be partial or complete, sudden or degenerative. Depending on the severity of the rupture, surgery may be required. My first Lab experienced such a rupture when chasing a Frisbee outside. He returned to us holding his back leg up and had to get surgery to repair the torn ligament. Labs are also at risk for obesity. For many of them, food is everything. Therefore, it’s up to their owner to regulate their diet to keep them from gaining weight. Great Danes are at risk for arthritis, bloat (gastric dilatation-volvulus), bone cancer, dilated cardiomyopathy, hypothyroidism, hip and elbow dysplasia, and wobbler syndrome. Wobbler syndrome is a general term to describe several spine-related issues, including cervical spondylomyelopathy (CSM), cervical vertebral instability, and cervical vertebral malformation-malarticulation. It is seen most often in Great Danes and Doberman Pinschers. When this syndrome occurs, the spinal cord or its nerve roots are compressed. Therefore dogs will experience neck pain and other neurological problems. When you see a dog with wobbler syndrome, it is easy to understand the nickname. These dogs appear uncoordinated and “wobble” as they walk. Wobbler syndrome in Great Danes typically occurs before three years of age. Any signs of neck pain in your Labradane should be addressed immediately with a visit to a veterinarian. A responsible breeder will be knowledgeable about the health risks these breeds face and will have health tested both parents before breeding. This way they can avoid breeding dogs with health issues. You should be able to discuss these health tests with any prospective Labradane breeders. Be sure to ask any questions you may have about the health of your future puppy. With both parents being friendly animals, your pup may jump on you or others out of excitement. This trait should be worked on from a young age. A Great Labradane could easily knock over children or the elderly once full grown. It is important that your Great Dane cross Labrador gets plenty of exercise. Not only will this keep them out of trouble, but it’s crucial to build up muscle and prevent weight gain that could lead to health issues. If long walks aren’t for you, you can teach your dog to play fetch. This will likely be easy if your cross takes after the Lab. My own Lab is a natural born fetcher who finds meaning in the rotation of flying tennis balls. If you do prefer a walk or a jog, you will want to train proper leash manners. The parent breeds are strong dogs with curious noses. No one enjoys being pulled around the neighborhood. Even though the parent breeds are usually amicable, socialization is still important. You should focus on it from the moment you bring your puppy home. Dogs that are not properly socialized with others may simply show disinterest, but in the worst case scenario they could become fearful or aggressive. If you want your Labrador Retriever Great Dane mix to enjoy spending time with two-legged and four-legged visitors alike, then you need to socialize him. Though a Labradane’s even-tempered demeanor makes him seem suitable for just about anyone, there are other factors that should be considered before adopting. Labs and Danes share some of the same health issues. Though there is no promise that any of them will occur, it is important that the owner of a Lab Dane mix be prepared for them. This means giving your dog proper exercise and preventing weight gain, which could lead to or worsen issues such as hip dysplasia. It also means understanding the possibility of serious health problems and being prepared for potentially expensive vet bills. Aside from health considerations, both parent breeds were originally bred to hunt (and the Lab is still a very popular choice for this). A Great Dane Lab mix will have a good nose that may lead them to chase after critters in your yard. You will either want to dedicate time to training boundaries or invest in a fence if you don’t already have one. Designer dogs can sometimes be difficult to find. Your best bet is to look around online and check local newspapers. Once you find any Labradane breeders you are interested in, it is important to visit them, ask questions, and see the parent dogs. You should ask about the parents’ health histories and any past injuries, like cruciate ligament ruptures in the Lab. A responsible breeder will have health tested the parent animals and be able to discuss the results with you. They may even ask you some questions to make sure that their puppies are going to a suitable home. Is a Labradane the Right Choice for You? If you want a smart dog with a good temperament that does well with both people and dogs, then a Great Dane Lab may be for you. However, it is important to remember the health risks associated with the parent breeds. Even if your puppy comes from two healthy dogs, you need to prepare for these issues. This could mean investing in pet insurance or just being aware of your financial situation. Exercise is essential for Labrador and Great Dane mixes. Not only will it keep them out of trouble, but it will help build muscle and prevent weight gain. Lastly, you should not leave any dog alone for long periods of time during their youth. If you are gone for most of the day, consider using a pet sitter or doggy daycare, or hold off on getting a puppy until your schedule frees up a bit. Baker, Lauren A., et al. “Genome-Wide Association Anaylsis in Dogs Implicates 99 Loci as Risk Variants for Anterior Cruciate Ligament Rupture.” Plos One, vol. 12, no. 4, Apr. 2017. Beuchat, Carol. “Health of purebred vs mixed breed dogs: the actual data.” The Institute of Canine Biology, 29 Mar. 2015. —. “The myth of hybrid vigor in dogs…is a myth.” The Institute of Canine Biology, 22 Dec. 2014. Bonelli, Marília de Albuquerque, et al. “Comparison of Angle, Shape, and Position of Articular Processes in Dobermans and Great Danes with and without Cervical Spondylomyelopathy. BMC Veterinary Research, vol. 13, no. 1, 24 Mar. 2017, p. 77. Cargill, John and Susan Thorpe-Vargas. “Hypothyroidism: A Highly Inheritable Canine Health Hazard.” Dog World, vol. 83, no. 1, Jan. 1998, p. 20. Clark, Leigh Anne, et al. “A missense mutation in the 20S proteasome β2 subunit of Great Danes having harlequin coat patterning.” Genomics, vol. 97, no. 4, Apr. 2011, pp. 244- 248. Kohler, Manette. 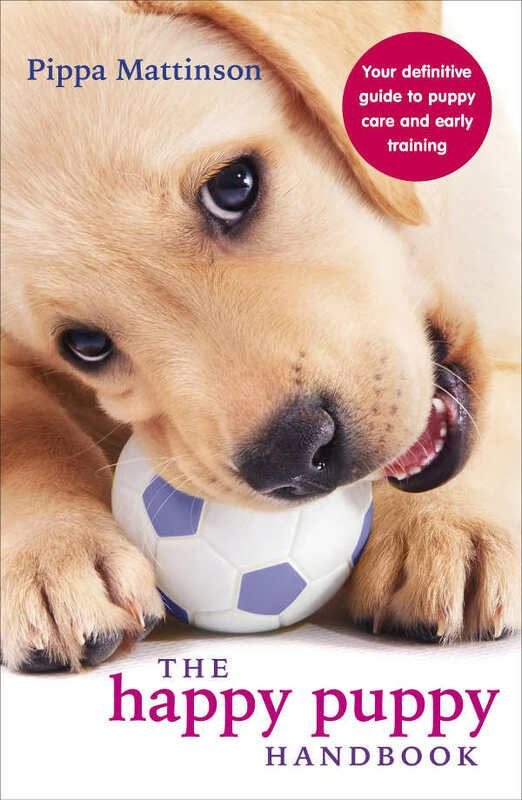 “Understanding Wobbler Syndrome.” Dog World, vol. 88, no. 5, May 2003, p. 12. Levine, Michael and George E. Moore. “A Time Series Model of the Occurence of Gastric Dilation-Volvulus in a Population of Dogs.” BMC Veterinary Research, vol. 5, Apr. 2009, p. 12. Living With a Labrador Retriever. Edited by Jo Coulson. Barron’s Educational Series, Inc., 2000. Mattinson, Pippa. “Purebred Vs Mutt – Common Objections To Mixed Breed Dogs.” thelabradorsite. Red Cat Media Ltd, 8 Jan. 2018. Ramos, Renato M., et al. “Morphological Changes of the Causal Cervical Intervertebral Foramina Due to Flexion-Extension and Compression-Traction Movements in the Canine Cervical Vertebral Column. BMC Veterinary Research, vol. 11, Aug. 2015, p. 184. Strain, George M. “The genetics of deafness in domestic animals.” Front. Vet. Sci., vol. 2, no. 29, Sept. 2015. Wargo, Meredith. “Beware of BLOAT.” Dog World, vol. 96, no.7, July 2011, p. 40. I think it is sick to mix these two fantastic breeds of dog. What do you want to achieve? A better than best dog? Get something better to do with your life. The breeds are not broken, so why try to fix what is already in place? There should be a law against this. I have a 9 year old Labradane and he is the greatest dog EVER! He trains easily, he is so sweet and gentle. He is definitely the best of both breeds. He’s large and enjoys playing in short bouts and then loves to chill on the couch next to me. He loves the dog park and will play with other dogs but will also occupy himself in our yard chasing birds and squirrels or just lie in the sun watching flies. We hit the jackpot with this dog. He’s so awesome! Looking for a laberdane also. Can you help Me? I also have a puppy exactly the same but I am not sure about the breed is he a labradane or something else would you please help me to get to know about his breed. Can you give me any leads to help point me in the direction of a Labradane breeder?